1. The shaft of the knives( top and bottom) is design to be an an integral whole, it is convenient to install, pick and place. 2. This machine adopts computer screen control with a counting device which can be preset production. Gap of the PCB cutter tool displayed by the display screen directly. 3. 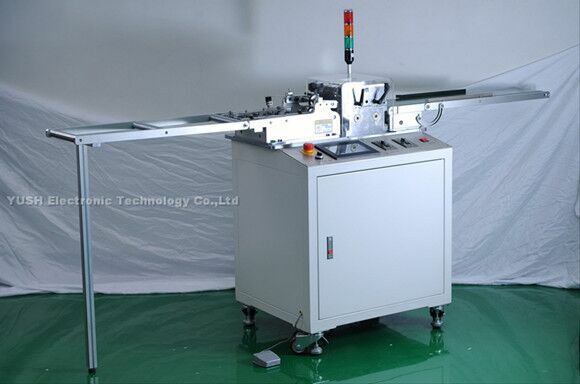 All the v-cut pcb board can be PCB cutter by this machine. 4. Using the machine to PCB cutter , reduce stress, prevent the solder joint cracking. 5. pcb board is PCB cutter by multiple cutters which can PCB cutter several board once. 6. The machine top PCB cutter wheel can be slightly adjust:0-5mm. 7. The distance between the knives can be adjusted, and it is suitable to PCB cutter single pcb board within width 15-20mm. 8. Blade is made of SKH51 high speed steel with long service life and wear resistance. 9. PCB cutter speed can be set and conveniently adjusted by turn-knob. 10. Install conveyer belt, pcb board which is cut can be sent out directly, then docking with the next machine and reducing the times of artificial pick and place. This machine can cut LED panel, fiberboard, aluminum board (more than 400mm ) and special board. 11. With several knives, the machine operates simply and efficiently and is suitable for mass production.